Phil Robertson has been sailing out of his skin to be joint top of the leaderboard with Simone Ferrarese after a stunning day of sunshine and strong wind at Stena Match Cup Sweden. In another last-gasp thriller, Adam Minoprio was just ahead of Ian Williams coming into the finish, but with the Team Alpari FX yet to wipe off a penalty. The Kiwis looked buried but like a wounded animal lashed out at GAC Pindar just metres from the line, suddenly dropping their spinnaker to the deck and luffing the British skipper whose own spinnaker was still fully hoisted and flailing in the breeze. Minoprio got the penalty he wanted against Williams, cancelling his earlier infringement and leaving the New Zealanders clear to sail across the line for a stunning victory. Local qualifier Henrik Eyermann has struggled against the full-time match racing crews and without a win from his first eight matches, is the first to exit the regatta. Some of the Tour Card holders are clinging on by their fingernails such as Pierre Antoine Morvan who has won his last two matches but will need to continue that winning streak all the way to the end of Qualifying if the Vannes Agglo Sailing Team is to guarantee going through. Keith Swinton and Johnie Berntsson have made the mountain even steeper by each picking up half-point penalties for damage incurred in their matches against local qualifier Staffan Lindberg and Alandia Sailing Team. Berntsson and Stena Sailing Team tried to bear away behind Lindberg just before the start but smacked into the back of his rival and paid the price. It was an action-packed, dramatic day, even by the standards of the Alpari World Match Racing Tour. 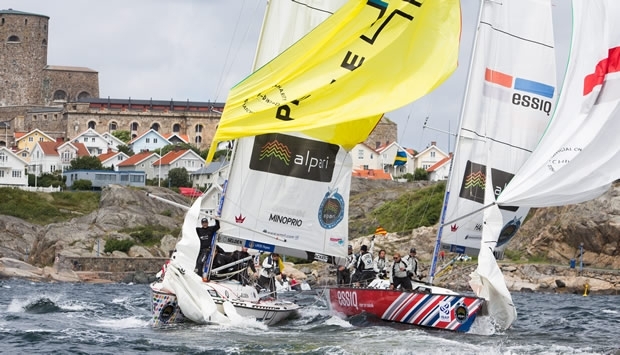 With the wind blowing hard and the sunshine attracting the crowds to the beautiful island of Marstrand, it was a classic day’s racing, one that would have brought a smile to the face of the late and much-missed Peter Klock. Klock, who passed away just before Christmas after a brief battle with cancer, co-founded the Stena Match Cup Sweden in 1994. At the opening ceremony in Marstrand last night, Peter Klock was announced as the fourth inductee into the Hall of Fame, next to Magnus Holmberg, Peter Gilmour and Pelle Pettersson. It was a fitting tribute to a man who dedicated much of his life to growing the sport of match racing, and who was instrumental in turning the Stena Match Cup Sweden into such an enduring and successful regatta. Tomorrow the action continues as Qualifying draws to its conclusion, with a number of big-name sailors looking to make it through to the final eight for the knock-out phase of the competition.